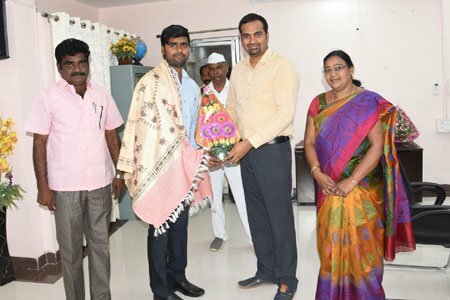 LPU Alumnus Ravi Teja – B.Tech Mechanical Engineering (2011- 2015) from Telangana was felicitated for securing the 555th rank in UPSC results by Collector RV Karnan. He is also the first person to have cracked the civil services from his district. He thanked his parents and teachers for extending him unwavering support in achieving the rank. Collector RV Karnan complimented Raviteja for achieving the rank and advised him to efficiently serve the public after joining the services. He also congratulated Raviteja for bringing recognition to the district by shining in the UPSC examinations and lauded his parents for playing a vital role in his success. Raviteja, son of a government teacher, said that he would focus on improving his rank by appearing for UPSC Mains to be held in the near future as he was interested in joining the IAS.